Operating System virtualization on the client side has many benefits including better security and more flexibility. Depending on the resources available on your computer you can setup an entire virtual lab running numerous operating systems for testing. Additionally, virtualization allows you to test software and perform other activities in a sandbox environment that will not affect your primary operating system. You can infect your VM (virtual machine) but the rest of your computer will be safe. There big players in the client virtualzation arena are VMWare Workstation, Microsoft Virtual PC and Sun VirtualBox. All have good products but only the Microsoft and Sun products are 100% free (and just a good as VMware IMO). I have personally used both Virutal PC and VirtualBox for many years and recommend both for your virtual environment. Virtual PC always has great support for Windows operating system while VirtualBox does Windows well and is compatible with more Linux and Unix distributions. 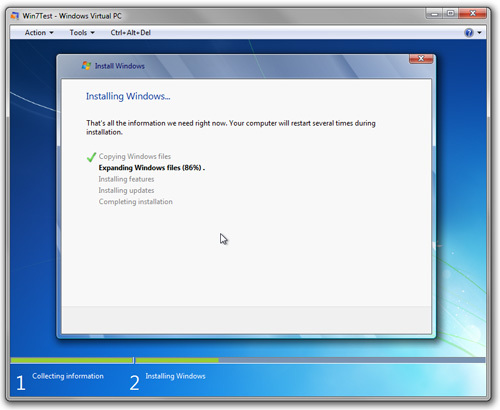 Depending on what operating system you run on your physical computer will determine what client virtualization software you can run. Using client virtualization software is very simple. It is just like using a physical computer but your virtual monitor is just another window on your desktop. You can boot up from a CD/DVD in your physical optical drive or use .ISO file and install the operating system in your virtual machine. Once you have your OS installed make sure you install the VM tools/additions/integration components on the virtualized machine for best performance.